I have long been fascinated by the power of absence. I hadn’t known that this was one element that drew me towards Slow Cinema until I saw my first of a number of Lav Diaz’ films, which so clearly play on the nature of the unseen, the present absence. More and more I also realise that my attraction towards this ghostly aesthetic probably stems from several holes in my family history, which I’m now seeking to clear up. There is always a reason for one’s attraction to a piece of art, or a film, and often one isn’t aware of the underlying reason for being emotionally moved by something. The fascinating aspect of absence, which, to me, is related to the element of space, is that it distorts our perception of time. In many ways, time appears to pass slower, in extreme situations perhaps even in slow motion. There are various reasons for “holes” in our life narrative. Absence is always connected to a loss of something, and this can take different forms. Death is probably the one we can all identify with, and the days and weeks after having lost a loved one always feel different. Time has a different meaning than before. There is a before and an after. I have long been an admirer of the writings of Georges Didi-Huberman, whose work seems to overlap with my own more often than not, and the further I move through his work, the more I see just how much value his books and essays have for Slow Cinema. Didi-Huberman is not an expert in cinema, which would perhaps rule him out for a lot of people because he just doesn’t know the field. Interestingly enough, it is probably precisely because he is writing from several vantage points – philosophy, art, history, and yes, cinema – that allows him to see things clearly, to take a step back, and to introduce new ideas. Or to simply open our eyes to what’s really in front of us. One would not necessarily pick up a study on the Italian artist Claudio Parmiggiani for an informed reading on Slow Cinema. But Didi-Huberman’s in-depth focus on “air, dust, traces, and haunting”, as indicated in the book’s subtitle (Génie du non-lieu – Air, poussière, empreinte, hantise), is exactly what one should pick up for a better, or even new understanding of the uses of absence in slow films. I have long used art books for my work on Slow Cinema, and there is a lot of remarkable material that many people, especially academics who think only in their own field, have overlooked. 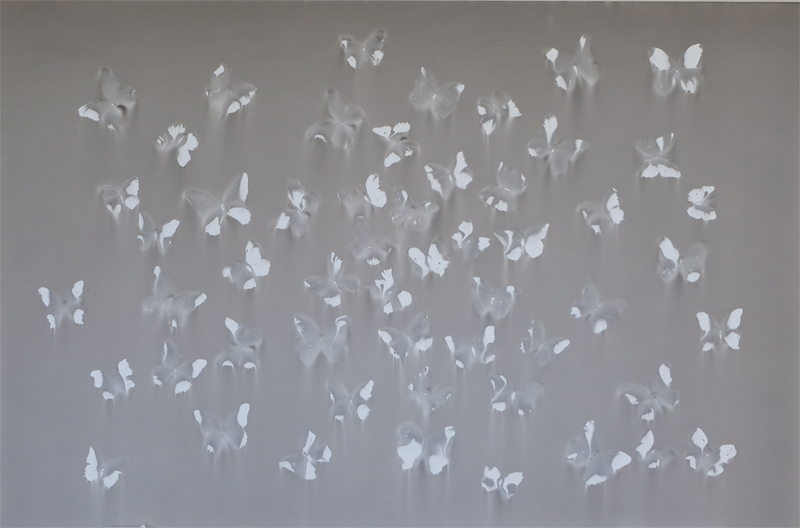 Claudio Parmiggiani is an exceptional artist, whose work focuses on absence, silence and fragmentation. Ignoring everything I have read, looking at Parmiggiani’s pieces online conjures feelings of loss, of pain, of longing, but also of searching and hoping. The power of time in form of patience, desire and waiting, Didi-Huberman writes, can never exist without an event, an action, that tears it up. There is nothing like a homogenous forward movement of time. There is a persistent alternation between calm and shock. This shock, as I have argued above, usually comes about through the loss of something or someone. A loss is always traumatic, like when you thought, in your childhood, that your dad really stole your nose when he made this weird finger movement in front of your face. You’re shocked, you cry. The calm disappears. The alternation between the power of time in form of slowness and its shock moments can be found in several slow films, but is most visible in the films of Lav Diaz, whose narratives live of this back-and-forth, especially his six-hour film Florentina Hubaldo, CTE (2012). There is this famous opposition in the works of Roland Barthes: what is and what has been. Parmiggiani, on the other hand, works on what remains. Barthes’ has been is absent, but continues to haunt the present. Parmiggiani shows the residues. He creates a picture of this haunting absence in the form of dust, or imprints. He makes it palpable, brings it out into the open. Didi-Huberman argues that dust (poussière in French) has its own time, it doesn’t follow the rhythms we establish throughout our lives. What’s more, dust survives us. It always will. Even though, as Didi-Huberman points out, dust is in permanent movement, it is perhaps the only permanent remnant of everything we do, of everything that our life is and has been. It’s what remains after our death. Dust is temporary and yet permanent. It is in movement, shifting from place to place, and yet remains where it is. The survival of traces, of dust, of imprints threatens our own survival, Didi-Huberman writes. Is this the reason why we feel uncomfortable about it? Is this why feel haunted, why we try to run away, in whatever way? The nature of slow films reminds us of those traces, and they usually do so by using the off-screen very effectively (and affectively). Parmiggiani’s work is all about the literal meaning of imprints and dust, at least in his magnificent series Delocazione. In effect, I find that he gives an image to what those two elements can also mean, namely memory. Persistent memories, haunting memories, memories that are transmitted from one generation to the next. Memories survive us, and this very survival, this longevity, threatens us and our calm existence. They bring upheaval, pain, change. This “dust” forms the core of most slow films that I have seen. I have argued previously on this blog that slow films centre around Barthes’ what has been. In fact, after having seen Parmiggiani’s art, I more and more believe that we’re actually speaking about what remains in those films. We’re speaking about remains, residues, dust. We speak about what survives us, what remains after we’re gone. We feel our own impotence of something much larger than us. Do we not? There are good films. There are bad films. There are exciting films, awesome films, overwhelming films. There are also underwhelming films, those that are total junk and a complete waste of time. There are those exclamations like “wow!” or “no, no, I don’t believe this!”. Maybe even something like “best film of the year for me!”. And then there is Hu Bo’s first and only feature film An Elephant Sitting Still, which he had completed in late 2017 before he committed suicide. There is no word or expression in the three languages I speak that would help me express what I feel about this film. There are films that make you interested in film, and you pick it up as a study subject at university. Or you pick up a camera yourself. There are films that touch you deeply. Films that make you cry, make you laugh. People sometimes speak of emotional rollercoasters. And then there is An Elephant Sitting Still, which makes me want to stop watching films because I don’t want to stain what I have seen with other films. I would like to keep this film as the last film I would ever see because it is so rich, so pure, so deep. We are all looking for something in life. You might not be aware of it until you find the one thing that you had been looking for. I have been looking for An Elephant Sitting Still. My now ten years in film, especially in slow film, on a quest to find the answer to something I haven’t even asked a question about, have found what I seem have been unconsciously looking for. And this something doesn’t have a word. Or a feeling. It’s something deep inside me. Milan Kundera wrote a book called The Unbearable Lightness of Being, later adapted to the big screen. The Unbearable Weight Of Being – this is what Hu Bo captures. The weight of living, of breathing, of surviving, or trying to. The weight of our times. 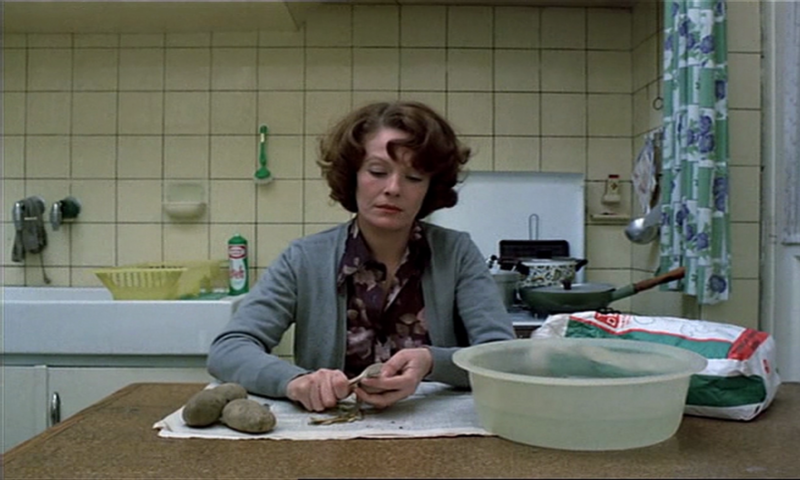 Chantal Akerman always wanted us to feel time. Hu Bo wants us to feel the weight of it. The calculated stillness in numerous extended long-takes functions like the weight of an elephant, several tons that crush you underneath its feet. You fight, but what do you fight for if there is no alternative? The time spent on fighting the agony, on lifting the weight of time, only adds to the feeling of hopelessness. Hu Bo’s characters struggle with the existential question of what their life is worth. This isn’t a truly pessimistic look at life. It is, rather, an existential look at our times, at our stillness in the face of time. Hu Bo’s moving images are drained of energy, of colour. The film itself is tired, but uses its last bit of energy on telling its characters’ stories. There is resistance, yet not enough in the face of an overwhelming external and invisible force. Every hour spent with the characters feels like an entire life. It is not just the weight of time that drains the characters. It is their anger, often contained, swallowed, until the last straw break’s the camel’s neck. Then, verbal and physical violence becomes omnipresent, but only briefly, often in the off. There is a boiling point which the film is headed towards. Not a climax, followed by a denouement. An Elephant Sitting Still is eternal. It is our film, our malaise of trying to make something out of our lives in an increasingly hostile world in which we millennials are the first generation to feel the brutality of this new age in which it is difficult enough to survive and even more difficult to live. Elsewhere is always close. We see one character, up close, and another blurred in the background. Elsewhere. The dream of something better than this. A dream that keeps us going, crawling almost, with the few resources we have left. And yet, Hu Bo’s Elephant is not hopeless or worthless, as the film’s characters think they are. Elephant is the one reason why all of this is worth it. Endnote: If you expected an in-depth review of the film, I’m sorry that I have disappointed you. The experience of Elephant is special. I have thought for a long time that I shouldn’t write about it at all. I don’t want to talk about it either. Elephant is inside me, and only I have the key to it. Never in my life have I had such an experience, but, as I have said above, all of the struggles in my life were worth it if it meant discovering such a film at some point in my life.